AMSOIL- "Our Company makes the Best Lubricants in the world, period, and challenges anyone or any company to prove us wrong! That won't happen because our competitors know it's true." If a car dealer or quick lube make their money off people with poorly running cars, why on earth should you trust what motor oil's, transmission fluid or gear lubes they recommend? These people should be the very last people you should trust when it comes to putting the best products in your vehicle that will help it last the longest. Current recommended practice is to change the motor oil in your engine every 3,000 miles with conventional oil as well as with other brands of synthetic motor oils. This is completely unnecessary with the AMSOIL technology that is available today, and has been available since 1972. The auto companies all know about our products but are " afraid" of it. It can cause them lost profits in service work, parts sales, quick lube motor oil changes and on a long term basis, regular repeat vehicle sales since engines, transmissions and differentials have been proven to last longer with AMSOIL. Dealerships like to keep customers coming in every 3000 miles selling lower quality oil so they have an excuse to make more money from the customer multiple times. Did you know that any petroleum motor oil only has a film strength of about 400 psi where AMSOIL has a film strength of 3300 psi and does not break down, shear or loose viscosity under heat and stress? Petroleum motor oil breaks down under heat and stress and leaves carbon, varnish and sludge deposits in your engine and allows your critical engine components to wear much more rapidly. It's no wonder you have to change it every 3000 miles and your local quick lube or auto dealer can't wait to see you again to charge you more of your hard earned money! Lubricants World Magazine interviewed the president of Jiffy Lube International (owned by Penzoil- Quaker State), Marc Graham states that if they can get customers to shorten their drain intervals by 100 miles it would mean an additional $20 million in revenue for the company per year and if they can get consumers to do one more motor oil change per year it would mean $294 million for the motor oil change alone and $441 million in revenue when they include ancillary products and services that go along with the oil change. In fact, Graham openly admits that the bottom line is profits. The shorter the drain interval the more money companies like Jiffy Lube and Penzoil-Quaker State make. They don't care about your vehicle and selling you a quality extended drain interval synthetic. All they want is to see the same customer over and over again as often as possible! This is the typical AMSOIL and filter set up for a first time user using the engine flush. With an EaO filter and one of our extended drain oils, you can safely go up to 15,000 to 25,000 miles on a single oil change depending on your vehicle. If If our synthetic motor oil isn't as good as it says here in the articles then NASCAR drivers, police fleets, commercial trucking fleets and professional race car drivers wouldn't be endorsing it here with their testimonials. If there was something out there that was better than our oil, those people would be using it. If our claims were untrue, they would be sued by Mobil 1, Royal Purple, STP, Redine, Prolong, Shell, Valvoline and Castrol. Police, fire, taxi, ambulance and commercial trucking fleets can save a fortune with our products. In fact, we know of several major NASCAR racing teams that use our oil in their race cars yet the motor oil sponsors logo on the hood and quarter panels is not what is in the vehicle! They want you to believe it is, but it isn't. Fact is, every successful major race car in the world uses synthetics, and about 85% of them use AMSOIL synthetics. We know exactly who these racing teams are but are not permitted to advertise who they are because they have such a large amount of money at stake with their sponsors wanting the public to believe they are using the brand of motor oil that is is advertised on the car. AMSOIL has been making 25,000 mile oils since 1972! The 3000 mile motor oil change is nothing but a myth and a money generating plan which virtually guarantees your vehicle's engine and powertrain will wear out at an early age when using conventional oil. Pictures of long term usage of conventional oil. Read about the Auto Industry's Best Kept Secret. Learn what they DON'T want you to know. Some people call it "Ams Oil" or "Amzoil" - It's just plain old "AMSOIL"... pronounced "Amzoil"
ASMOIL, Amsol, Emzoil and Emsoil, Amsiol motor oils are typed wrong. You found the right page. 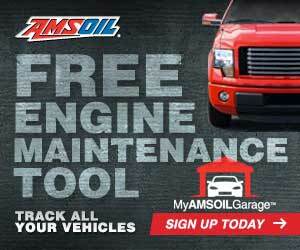 Convenient ordering from home or business with an AMSOIL Catalog makes it easy to get product!